I began this set of jewelry with some beautiful, round polymer clay beads handmade by Bonnie Simonet. 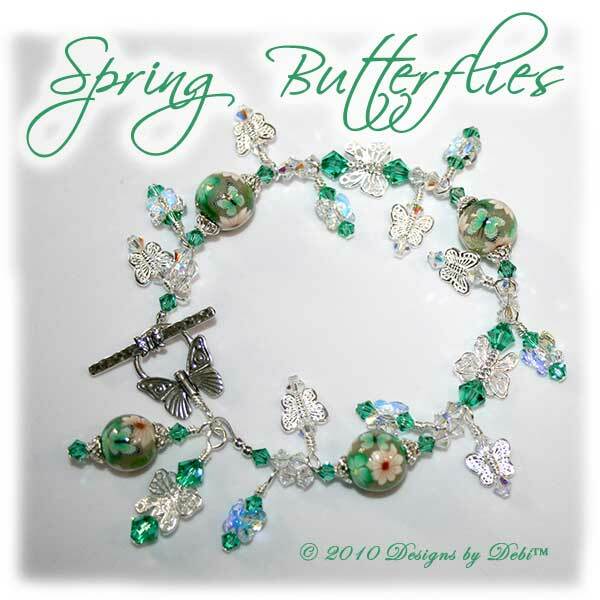 With their flowers and green butterflies, they are a cheerful reminder that spring is coming. 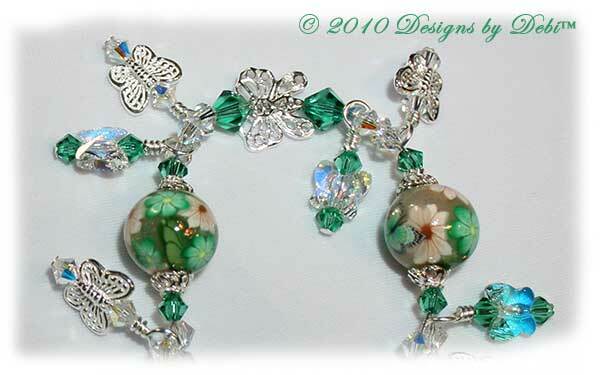 Her beads are joined by some dainty filigree sterling silver butterflies. Swarovski® Crystal AB (aurora borealis) and light emerald bicones are used throughout the design. 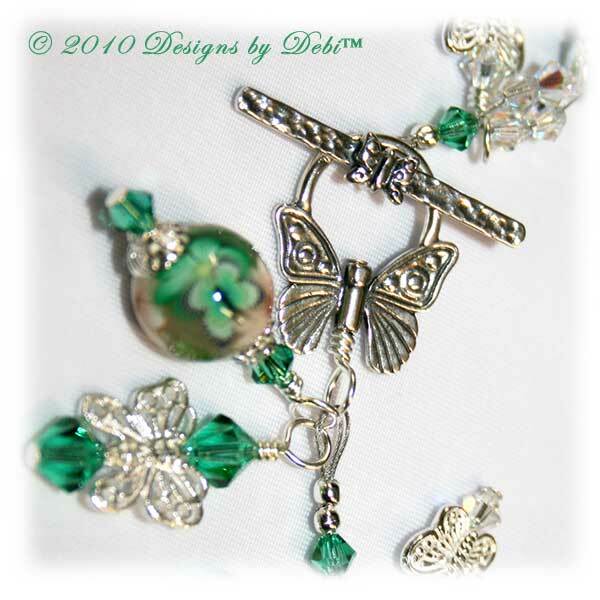 Butterfly charms hang and sparkle playfully along the length of the bracelet. 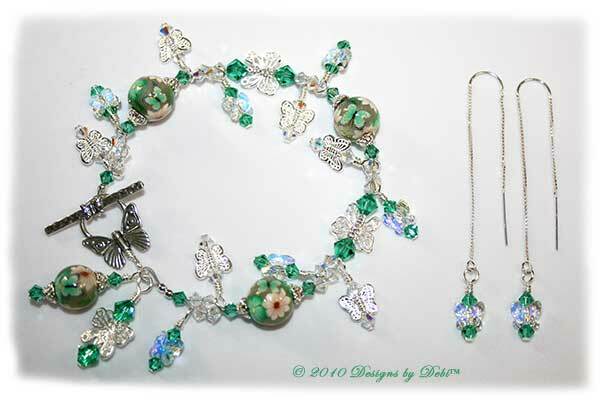 Some are sterling silver butterflies with crystal AB bicones and some are crystal AB butterflies with light emerald bicones. I also placed two extra dangles near the clasp which is a beautifully detailed sterling silver butterfly toggle. 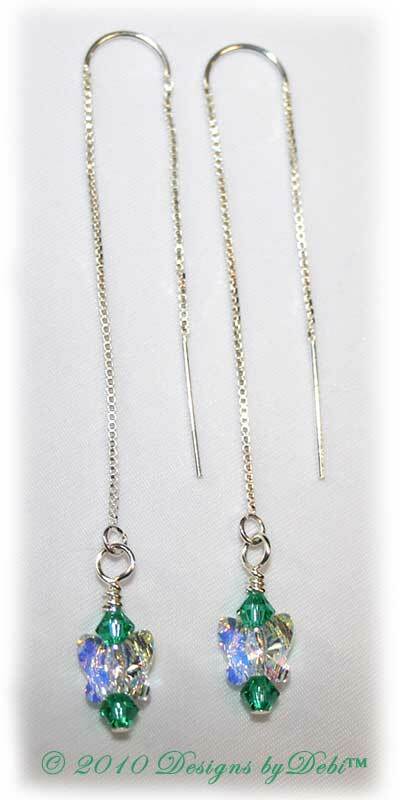 The matching sterling silver ear threads feature Swarovski Crystal AB butterflies and light emerald bicones that dangle and swing as if in flight. March is Intellectual and Developmental Disabilities Awareness Month and it holds special meaning for me. My cousin is mentally handicapped and, although he is only 2 months younger than me, his mental age has been estimated to be that of a 7 year old. The awareness ribbon color for this cause is green and determined the color scheme for this month's jewelry. I have chosen two charities to split the donation from this set of jewelry. As I have seen with Steven, they contribute, each in their own way, to a well-rounded life for people with intellectual and developmental disabilities. Special Olympics is a charity most people are familiar with. It was founded by Eunice Kennedy Shriver in her backyard in 1958 and back then was called "Camp Shriver." The first official Special Olympics Games were held at Soldier Field in Chicago in 1968. Now, through year-round sports training and competition, Special Olympics empowers individuals with intellectual disabilities in more than 180 countries. It's often the only place where they have an opportunity to participate in their communities and develop belief in themselves because many are socially excluded from full participation in schools or society. Special Olympics sports are a gateway to empowerment, competence, acceptance and joy. I was actively involved in Special Olympics in my hometown as a coach for many years. I coached sports year round (basketball, soccer, softball, volleyball, etc.) as well as the track and field Special Olympics Games and truly got to see just how much this organization does for and means to these athletes who are happy just to play...win or lose. The athletes oath is "Let me win. But if I cannot win, let me be brave in the attempt" and believe me they are. The joy of competition and excitement about accomplishments that so readily shows on their faces is priceless. The Arc may not be as well known, but is extremely important for these individuals as well. It is helpful from an entirely different perspective. The Arcs vision is that every individual and family affected by intellectual disability in the United States has access to the information, advocacy, and skills they need to participate as active citizens of our democracy and active members of their community. They work to ensure that people with intellectual and developmental disabilities and their families have the support they need to live an ordinary, decent American life. Steven goes to his job at The Arc of Northern Rhode Island five days a week and he enjoys it...he loves to go to work! It gives him a chance to interact with his friends and co-workers, have a job performing tasks appropriate to his skill level and something to be proud of. To find out more about Special Olympics and The Arc or to make donations on your own, you can go to www.SpecialOlympics.org and www.TheArc.org. The bracelet measures 9 inches and will fit a 6 1/2 inch (very loosely) to 7 1/2 inch wrist. The earrings are 3 1/4 inches long. If you need the bracelet re-sized, please let me know at time of purchase and this can be done prior to shipment at no additional charge. Note: If you are looking for a traditional style sterling silver and Swarovski crystal Awareness Bracelet, they are available for custom order in all colors. Please see the Awareness Bracelets page.